Graduate student Nicole Aponte Santiago uses fruit flies to probe the relationship between the many nerve cells passing signals from the brain to the muscles. As fifth year graduate student Nicole Aponte Santiago puts it, she has the power to alter nerve cell activity in fruit flies at will. She’ll also tell you point-blank that flies are her favorite model organism, although that wasn’t always the case. They have many well-cited advantages — they procreate often, have short lifespans, and many of their genes overlap with humans while being easy to manipulate. But Aponte suggests an additional reason for her change of heart. She suspects “looking them straight in the eye” so frequently ultimately convinced her, using their physical features to deduce their genetic makeup, and from there investigate the relationship between the many nerve cells (neurons) passing signals from the brain to the muscles. Aponte credits her initial interest in science to her father, a dentist who used to take her for long walks on the beaches of Puerto Rico where she grew up. Together the two would examine the minute details of the coastal world around them, discussing various phenomena. Where does sand come from? How do the tides form? What types of shelled critters reside at the sea’s edge? 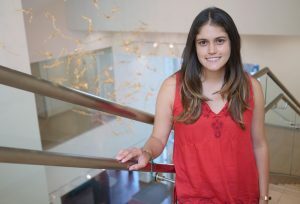 She first set foot on MIT’s campus in January of 2011 while a sophomore at the University of Puerto Rico, Río Piedras, attending the weeklong Quantitative Methods Workshop to learn various quantitative tools and programming languages. In June of that same year she returned, this time for 10 weeks as an MIT Summer Research Program (MSRP) student. Aponte joined Hazel Sive’s lab at the Whitehead Institute for Biomedical Research, gathering preliminary data for a paper that was eventually published in Fluids and Barriers of the CNS. As a first-year graduate student in 2013, she tested out several different labs and ultimately chose Troy Littleton’s lab located in the Picower Institute for Learning and Memory. She was drawn to the friendly and collaborative atmosphere, as well as the breadth of potential projects — from those related to the central nervous system and Huntington’s disease to the connections between nerve cells. Aponte investigates how nerve cells interface with one another and neighboring muscles, focusing on the tiny gap between neurons and muscles, known as neuromuscular junctions. Multiple neurons can form connections with the same neuron or muscle cell, but which connections remain depends on competition between the nerve cells and how often those connections are used. New ones are constantly being shaped as we learn new things and acquire new experiences, while less frequently used connections get trimmed away. 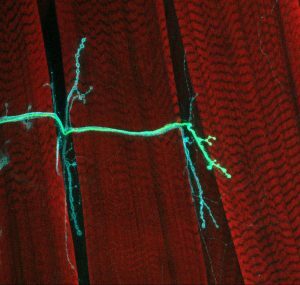 Aponte wants to understand how neurons that talk to the same muscle cell interact with each other, determining which lines of communication will be strengthened and which will be pruned away. When Aponte first began in the Littleton lab five years ago, she screened scores of unique drivers — segments of DNA that “drive” gene expression in specific cells during a specific time in development. She hoped to find drivers that could trigger the expression of a green fluorescent protein (GFP) at the neuromuscular junction, and ultimately identified two different drivers which caused GFP expression in two separate neurons targeting the same muscle near the back of the fly. These drivers would allow her to control the expression of not just GFP, but also other genes that she connected to the drivers, including genes that can increase or decrease the activity of the neurons, or even kill them. “It’s really from there that my entire project was born,” Aponte recalls. Each morning, she heads to the fly room to collect virgin flies and determine which ones to breed in order to generate progeny with her desired genetic makeup. She can infer something about the flies’ chromosomes based on their physical characteristics, which allow her to keep track of their genes and create offspring with the GFP marker in her neurons of interest. As is true for most things these days, there’s an app for that. As we chat, she takes out her phone and begins to scroll through images that illustrate which genetic markers engender which physical characteristics. The Tubby mutation makes the flies rather fat, whereas Bar makes their eyes noticeably skinnier. The connections between neurons are labeled in cyan and the muscles are shown in red. The neuron highlighted in green is using GFP innervates the muscle. Recently, she’s stumbled upon a rather baffling phenomenon. When she kills one of the two neurons (let’s call it “Neuron A”) the other one, Neuron B, remains relatively unchanged. Yet, when she kills Neuron B, Neuron A shrinks. This suggests Neuron B may be sending a “permissive” signal to Neuron A, telling it to contact the muscle. She is monitoring the neuromuscular junction over time to determine if Neuron A will ever reach the muscle, and if the muscle will change over time in response. This endeavor will constitute her main focus over the next few months. 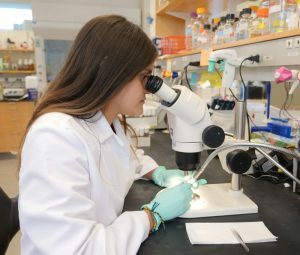 After she graduates, Aponte intends to pursue an academic postdoc studying flies, despite developing an allergy to her subjects over the past year. (She’s since acquired a face mask that keeps dust and fly particles away.) “I’m just excited to see where the research will take me,” she says. Now that’s dedication.